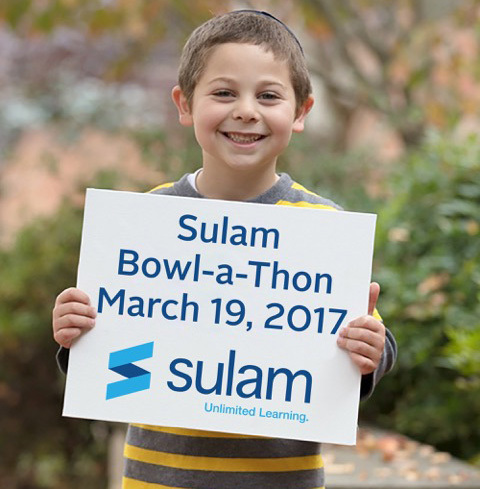 Support Sulam students and join us at the Sulam Bowl-a-thon! Register today for an evening of fun, great food, and the Ultimate Bowling Competition, all to support Sulam! All registered bowlers will receive a Bowl-a-thon T-Shirt, a delicious buffet dinner, and a great evening for a great cause! Team Captain – Register a team, then recruit your 4 person team and drive fundraising efforts. Our team minimum per lane is $500, but we believe you can raise more! Once you have registered your team, click here to donate towards your team or individual bowlers, and to check the status of your team. No lanes will be reserved until the $500 team minimum is raised. Bowler – Join a team of your choice and collect donations! Or… register as an individual bowler and we will put you on a great team! Each individual bowler must raise or donate $125 to participate. Once you have registered to bowl, click here to donate towards your team or individual bowlers, and to check the status of your team. No lanes will be reserved until the $500 team minimum is raised. Cheerleaders – Not a bowler? Want to come and cheer on your favorite team? CLICK HERE to contact Ahuva Orlofsky to find out how you can participate! Sponsor – Choose a sponsorship level to promote your business and bowl with your team to support Sulam! Whether you are a “King Pin” or fire more gutter balls than strikes, you can help make a difference in the lives of children in our community. Plus more to be announced at the event! Best of luck with your fundraising efforts, Marsha! Wooo!! Go, Marsha and team!!! Go Voortrekkers! Jy is heeltemal to beste in my boek. Good luck, Livin' on a Spare!!! Thank you Mrs.Katz for all your hard work!! Yay Yael and Aryeh Wielgus!! In honor hillel goldschein. The greatest man I know! we are going to pin the competition!! In honor of Aron Orlofsky and his dedication to Sulam! Good luck to rabbi lerner and rabbi wielgus! At Sulam, our team of special educators provides every student in K-12 with a highly individualized educational program – in a unique combination of inclusion in general education classrooms and targeted instruction – to help ensure maximum learning potential for a lifetime.